Do you belong to the Knitting Paradise forum? I do. Knitting Paradise is a forum for knitters who love all things knitting. If you’re looking for the latest in software and user interfaces, you won’t find it here, it is pretty basic. Don’t let that put you off because if you’re looking to share your passion for knitting with people from all over the world then you are in the right place. Got a knitting question? Someone on this forum is an expert. Want to share a picture of your latest creation? They love it. You can share links to your favorite patterns, tutorials and even tell your favorite joke. I didn’t know about KP (as we insiders call it) until last year. I’m now in, I’m hooked and think it’s a great resource. I know that whenever the blog views climb to a few thousand in a few hours, it’s because someone in the forum posted a link to it. They are very into new knitting techniques. So much so that I offered them a free pattern and I’d like to include you too. 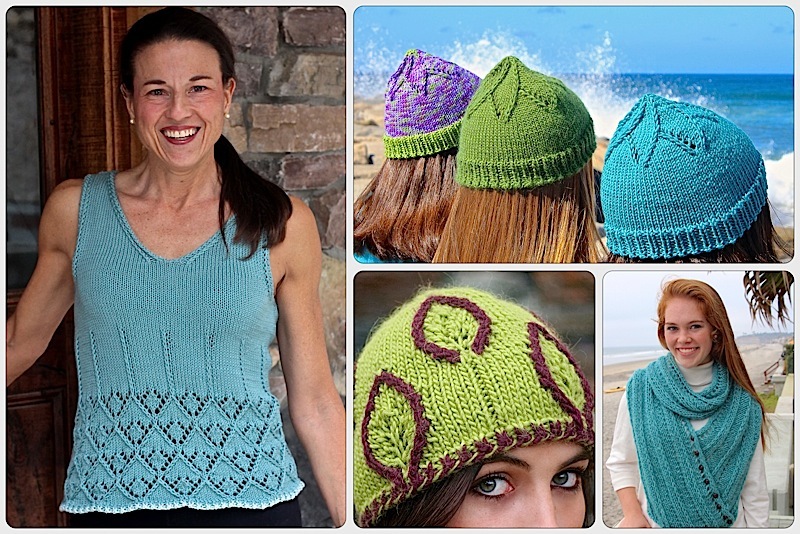 Free Knitting Nuances Pattern Thru Sunday Night January 24th. The Raised Diamond Points Blanket / Scarf is the latest blog post to get noticed on Knitting Paradise. That was our first post about the Showy Decrease and it’s a great introduction for all our new readers. Raised Diamond Points Blanket / Scarf pattern is on Ravelry and the free code is Paradise. Original blog post and More Photos on our website. If you’d like to try a pattern that’s a bit easier first, the Manchester Scarf is always free. It also has the very popular Hatch Edge. But wait! She had another one. Issuu.com has dozens of free books and magazines. A few are partials, but many are complete editions. They include books by Nicky Epstein and Vogue Knitting. And since we’re talking resources; there is a site that went live about a year ago that helps you find yarn substitutions. It’s called YarnSub.com. For example, I had some Zara Merino yarn, but I think it is discontinued. I entered ‘Zara’, the site gave me some options to choose from then voila! 15 recommendations for substitute yarns and tells me how well it matches. As a designer, I would love to provide alternative yarns in my patterns. Here are the individual links to the Slide Share books. Thanks KPers for the interest, the information and the fun. Thank you so much – very pretty. Looks like fun to knit. Great free books! Thank you so much from a fellow KP follower. This is one of the fantastic posts… I fell like I fell into a magical rabbit hole of knitting and crafting treasures. thanks so very much!!!!! Thanks Dragon Fly Lace! You made me smile. Disappointed is my 1-word comment. I’ve tried for about 15 minutes but I couldn’t find 400 Knitting Stitches. Not really complaining – I really wanted it. Hi Barbara, I just checked the link and it still worked for me. I can’t think of why it would not work for you. This entry was posted on January 21, 2016 by Laura Cunitz in General and tagged Free Knitting Books, free knitting patterns, Knitting Paradise, yarn substitution.